Walking with the Blessed Mother is one of the most gently loving energies from the Universe and the Realms of the Divine Feminine. 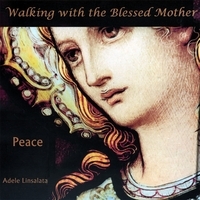 Adele has out done herself in this extraordinary CD as she guides you gradually in learning the breath of life and walks you through the doorways to meet The Blessed Mother and the Angelic Choir of Angels. You will want to listen to this entire guided meditation CD over and over again to find each aspect of your relationship with Mother and the Angels all around you. Walking with The Blessed Mother in her Rose Garden where she will share with you her tender loving energy, truths and gifts to you in the most gently way as she opens her arms to invite you into her heart. Peace to all in this gentle soothing meditation with the loving energies of Mother as she introduces to you the Song of the Angels to welcome the Choir of Angels into your heart and life. To journey with the Choir of Angels to form an Angelic Grid around Mother Earth as the Angels teach you how to send the Breath of Peace to Mother Earth and all Living creatures. “I find that when Mother is around we all feel the blessings of her gentle loving energy, she has a message for the world, one of Love, Acceptance, Compassion and Peace. We are at the times of our life when we all need to be kind not only to others but also to ourselves. To know now more than ever we are not alone and we are all LOVED. As you walk through these doorways in both of these guided meditations you will be embraced in the arms of The Blessed Mother and the Angelic Choir of Angels. Truly a gift from Heaven above. Please write and share with me your experiences with these two wonderfully Divine guided meditations. We are Blessed in this Light of Love that is with each of us right now. I am so excited and honored to be working with The Blessed Mother and all the Ascended Masters in the Higher Spiritual Realms, on so many more gifts and messages to be given and shared at this time of our own Spiritual Journeys”.